John A. Zannini ’83, second from left, follows the action at a PC game at Georgetown. Alongside him are Friar basketball broadcasters Joe Hassett ’77, third from left, and John Rooke, right. 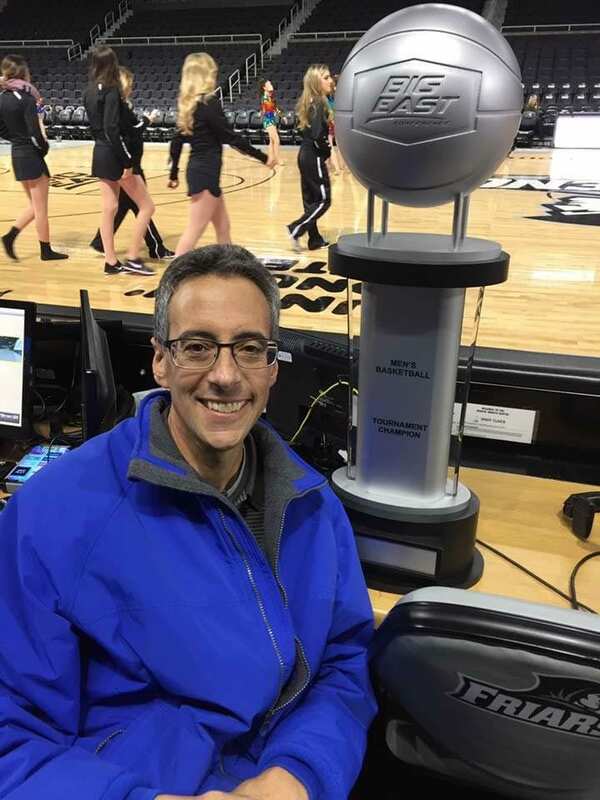 John A. Zannini ’83 was already part of the statistics crew for Providence College men’s basketball home games in the 1980s when he grew starry-eyed. In his case, he was more stats-eyed. Instead of tracking just one category — which was his primary function with the crew at the scorer’s table — Mr. Zannini was intrigued by the thought of keeping a more detailed and thorough log of every rebound and every assist. Luckily for him, the opportunity to become a “full-time” statistician was located a few seats down from his courtside post at the then-Providence Civic Center. One night during the 1988-89 season, Mr. Zannini introduced himself to John Rooke after a live airing of a television show featuring then-PC coach Rick Barnes. Rooke also happened to be the Friars’ play-by-play radio voice. Rooke was aware that Mr. Zannini and his father, John Sr., traveled to every Friar road game. 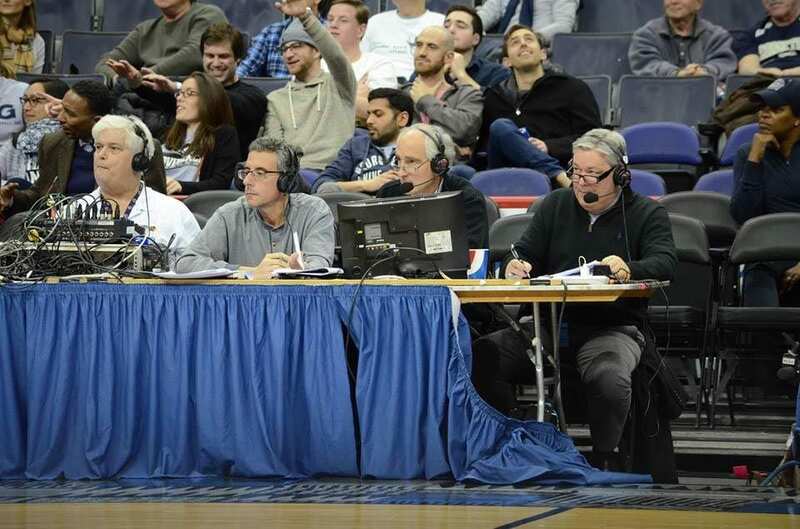 Spelling it out in crystal-clear terms, Rooke told Mr. Zannini that if he happened to see an empty chair alongside him and broadcast partner and former PC basketball standout Joe Hassett ’77 to join them and record statistics. John A. Zannini was a credit to his alma mater, where the history major also served as a member of the Friar Front Court Club and the Friends of Friar Hockey booster organizations. His attention to detail enhanced the Friar radio broadcasts and complemented his unbridled passion to see the basketball team succeed. The 2017-18 season marks the first time since that 1990 NCAA contest that Mr. Zannini isn’t involved with the PC basketball radio family. The Cranston, R.I., native passed away in June 2017 at age 55 following a lengthy battle with cancer. He leaves behind his wife Lisa and two children, Matthew and Alexandra. Mr. Zannini would stand up and position himself next to Rooke while his good friend wrapped up the broadcast with what in Friar circles became known as a signature signoff. As soon as Mr. Zannini heard Rooke say his name, he would offer a fist pump to the man who welcomed him into the Friar broadcast world. “It was a thank you for acknowledging his work, his dedication, and his passion for his school and putting out a good product,” said Rooke. How Mr. Zannini became known as The Stat Beast stemmed from doing what he did best. Listening to Rooke and Hassett describe the action, he would quickly react with a stat or an anecdote. Functioning at fast-break speed, he quickly jotted it down on a piece of paper before handing it off to the on-air talent. “One night I turned and said, ‘John, you are a beast!’” said Hassett. The penchant Mr. Zannini displayed when it came to conjuring up basketball tidbits that were done with the intent of enhancing the listening experience was never lost on the Friars’ broadcast team. As an indispensable contributor to the PC radio broadcast, Mr. Zannini was paid for his services, but the money hardly mattered. A paralegal and statistician for the law firm of Roberts, Carroll, Feldstein & Pierce, of Providence, he would fly to away games at his own expense and return with the team. He became roommates with Rooke on the road and had a press pass and an open chair waiting for him at every contest. 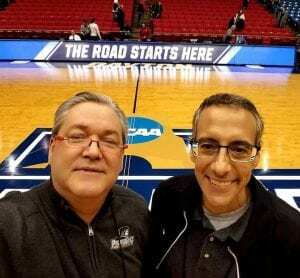 John Rooke, left, and John A. Zannini ’83 take a moment for a selfie at the NCAA Tournament First Four game in March 2017. Men’s basketball staff members and associates said Mr. Zannini took a lot of pride in the fact one of the team’s annual post-season awards was named after his father. The John Zannini Coaches Award, established in the early 2000s, is presented to a player who is a model student-athlete who may not get a lot of attention but who is an integral part of the team. In recent years, Mr. Zannini continued to soldier along despite battling his illness, determined to follow his Friars and assist his broadcast partners. His final game associated with the Friar basketball program came in March 2017 when PC traveled to Dayton, Ohio, for a First Four NCAA Tournament contest against Southern California. The chair that Rooke once offered Mr. Zannini will remain vacant for the time being. A Mass of Christian Burial for Mr. Zannini was celebrated on June 29 at St. Mary’s Church in Cranston.